All medical devices are regulated by Medical Device Authority (MDA) as part of Ministry of Health (MOH). Appoint a local authorized representative (LAR). Exempt from Conformity Assessment Reviews (CAB). Special cases may be audited Engage an accredited Conformity Assessment Body (CAB). CAB must be different from CAB in foreign countries. MDA verifies classification and upon approval issues a certificate and assigns a registration number. a) “medical device” means (b) any instrument, apparatus, implement, machine, appliance, implant, in-vitro reagent or calibrator, software, material or other similar or related article, to be used on the human body, which the Minister may, after taking into consideration issues of public safety, public health or public risk, declare to be a MEDICAL DEVICE by order published in the Gazette. 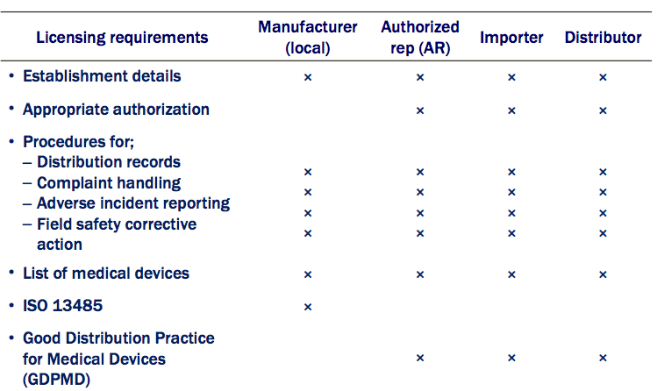 What is a conformity assessment body (CAB)?